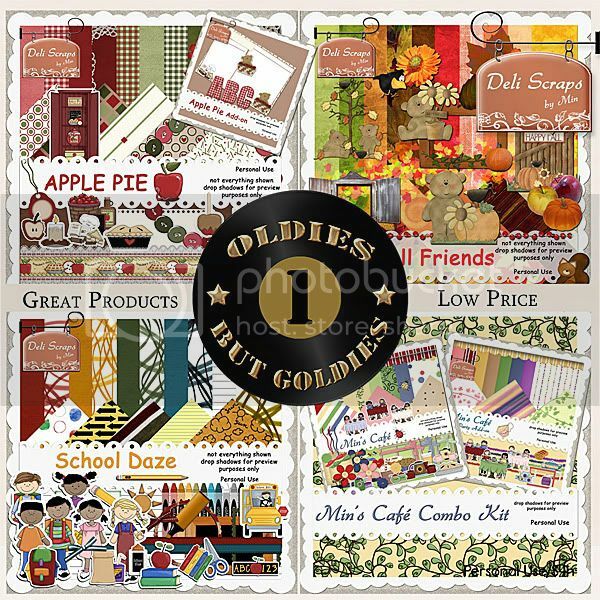 What day would be better to release my “Oldies But Goldies Vol.1” bundle including my “Apple Pie” kit?… And for today only you can pick it up for … you guessed it: $ 3.14 – that’s 81 % off the original prices of the included kits!!! Oldies But Goldies Vol.1 – I bundled up a couple of my older kits to make them available to you for a great price. This first bundle includes the following products: Apple Pie Kit, Apple Pie Add-on, Felty Fall Friends Kit, School Daze Kit, Min’s Café and Min’s Café Teaparty Add-on. Tomorrow is the last day of my time as featured designer at theStudio – that means it’s also the last day to pick up the freebie add-on kit in the forum and enter a layout to win a 10 $ GC to my store! !